State Superintendent of Public Instruction Joy Hofmeister sits with pre-K dance partner Briseyda Garcia during a February visit to Edgemere Elementary in Oklahoma City. The community is rallying to make real changes to the trajectory of the historic school. To read the story, click here. We did it! 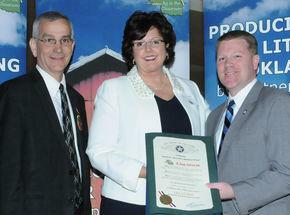 #OurStandards were officially adopted last week! Thank you for giving your time and expertise in the development of these new standards. 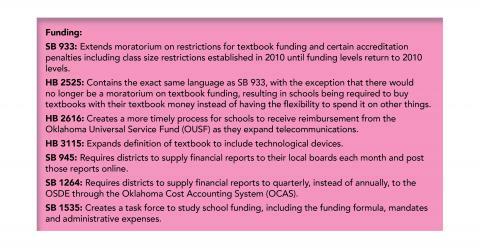 As a result, we now have academic standards developed by Oklahomans for Oklahomans. Written by 39 dedicated writing team members -- with more than 760 years of combined teaching experience -- and with key input from 1,964 teachers in PK-12, the standards represent what students need to know to be college- and career-ready. The process was an exhaustive and inclusive one, and so we also owe a debt of gratitude to 50 content experts from higher education as well as many others from CareerTech and stakeholder partnerships across our state. Now, important transitional work begins as we prepare for the start of the next school year. It’s time to shift our focus. We have moved from writing to the next crucial step of implementing superior math and English language arts standards. My team at the department is rolling out support to districts and educators. We have a plan to assist you at every grade level. The Office of Curriculum and Instruction will help districts by providing a crosswalk of P.A.S.S. with our new standards for ease in understanding the differences between them. We are also working with curriculum specialists and teachers across the state to assist with writing the curriculum frameworks that provide important exemplars, guidance and other teaching support. Moreover, we will be hitting the road with EngageOK! Look for dates and locations as we prepare to bring our annual summer conference to a region near you. To see the standards, support letters and ancillary booklets, click here. Thank you for all you’re doing to support our students! The Oklahoma State Department of Education’s education summer conference, EngageOK, will soon be in a city near you! Because of budget cuts, we are changing the format of the conference. EngageOK will not be held over several days in Oklahoma City as in the past. Instead it will take place in July at regional sites around the state. Thousands of educators attend this free annual training event, which offers professional development and important updates on federal and state education law. By offering mini-conferences in various locations, we hope to minimize travel and accommodations for teachers and districts while still offering the professional development they need. The change will also save the agency funding that it can pass along to schools. We are in the process of finalizing regional sites and agendas. Look for more details soon! Let’s compare today’s topic to something else we already know or want to know more about. To what extent is it similar or different, and in what ways? We need to dig deeper and analyze this idea. What is it made of? What are the component parts? True learning comes from application. What can you do with it? Tell us how it works. Real learning comes from synthesizing. What related thing does it make you think of? What could you create by combining it with something else? Create an argument for your thoughts. Take a stand for what you believe. Why it is important to know this? When students articulate their learning, it releases the power of positive discussion to do amazing things in the classroom. Deanna Smith and Marsha Kendrick, innovative teachers at Claremore’s Roosa Elementary School invented swinging footrests to attach to desks to keep fidgety children focused. The students love them. “Movement is such a key point of being able to learn,” Deanna says. Watch the video story from KJRH Channel 2, Tulsa. Marsha’s instructions for teachers who want to make their own busy bars. The new Oklahoma Teacher of the Year application is now available. Applications are due to the Oklahoma State Department of Education by Friday, May 13. If you have questions about the Teacher of the Year program, email Martha Eaves, OSDE events coordinator, or call (405) 522-8767. Finalists will be announced this summer. Download the 2017 packet. Your K-3 students could win a $250 prize in the PBS KIDS Writers Contest. The contest is supported by a robust set of resources for children. 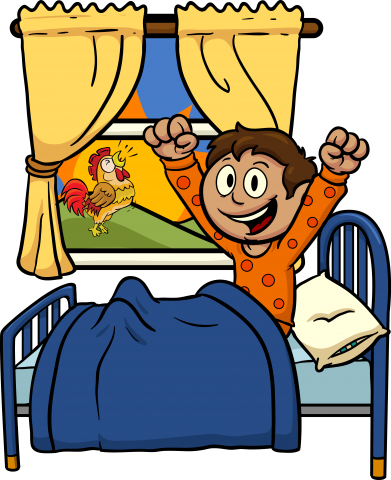 Story ideas, activity sheets and previous winning entries are available to inspire children during the brainstorming process with the Story Writing Fun Guide. Entries must be postmarked by April 15. For rules and entry forms, click here. In preparation for the Oklahoma Core Curriculum Tests, don’t forget to remind parents how important it is for their school-aged children to get plenty of sleep, eat a good breakfast and arrive at school on time. An informational letter from State Superintendent of Public Instruction Joy Hofmeister about the tests is available on page 3 of the OCCT Parent, Student and Teacher Guide. To access a printable copy of the letter to send home to parents, click here. All McDonald’s restaurants in Oklahoma will be offering free breakfast to 3rd- to 8th-grade students from 6 to 9 a.m., Monday, April 11, to kick off testing season. The Regional Food Bank of Oklahoma is offering free curriculum on the issue of hunger in Oklahoma for grades 3-12. Hunger 101 includes activities, supplemental worksheets and teacher resources, and is a companion to food and fund drives or service learning. For more information, click here. Find any certified teacher with the new Oklahoma Educator Search Tool on the Oklahoma State Department of Education website. Search by first and last name to find the district the teacher is working in and his or her area of certification. Lisa Storm (left) was selected as a 2016 Excellence in Teaching About Agriculture national award winner! The award will be presented to her at the National AITC Conference in Arizona this June. 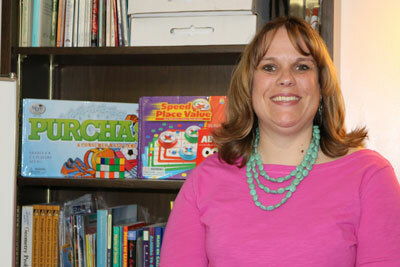 Lisa teaches third grade at Heritage Elementary in Kingfisher. Michael “Bubba” Tamez has been named the 2017 Oklahoma High School Principal of the Year by the Oklahoma Association of Secondary School Principals. “It is not about programs; it is always about people,” says the Eufaula High School principal. Cathy Walker, principal at Stillwater Middle School, has been named the 2017 Oklahoma Middle School Principal of the Year by the Oklahoma Association of Secondary School Principals. Cathy is in her 24th year as an educator, with 23 of those years at Stillwater Middle School as a teacher, assistant principal and principal. Sarah Vann and Mark Thomas are recipients of the Presidential Awards for Excellence in Mathematics and Science Teaching. It is the nation’s highest honor for teachers of mathematics and science, and only 107 teachers were selected this year for the national honor. Sarah is a science teacher at Owasso Eighth Grade Center, and Mark is a math teacher at Stillwater High School. Dana Parish of Bristow Middle School is the grand-prize winner of the PBS Get Your Tech On program. Dana won a classroom set of Chromebrooks and a document camera. Parish plans to use the tools to expand her Google Classroom, develop digital curriculum and utilize additional PBS LearningMedia resources in her classroom. PBS LearningMedia is available for your classroom. 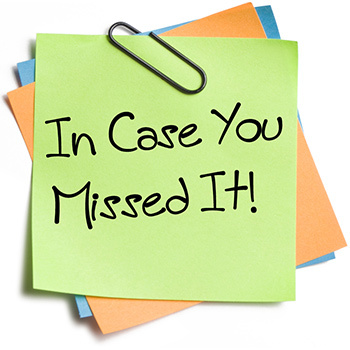 News from across the state! STEM MONEY: Wewoka Middle School is one of 15 finalists for Samsung’s Solve for Tomorrow STEM contest! Students have already won $14,000 in school technology and have a shot at the $120,000 grand prize. More than 4,100 schools entered nationwide, and Wewoka is the only Oklahoma finalist. Students traveled to New York City in March to present their plans for a water filtration system and are hoping to reach the second round to present their idea in Washington, D.C. To see the story, click here. To see the presentation videos, click here. SERVICE IS GOLDEN: “If I had it to do over again, I would try to do more” is exactly what you’d expect a woman who has devoted nearly five decades of her life to one school district to say. To see the video, click here. UP TO OUR NECKS: Olivia Hurd of Jenks High School won the grand prize in C-SPAN's 2016 StudentCam competition! Her short video documentary about the national debt bested 2,887 submissions from across the country. To see the video, click here. MARRIED TO THE JOB: Unlike many school districts in Oklahoma, John Rex Charter School is not experiencing a teacher shortage; in fact, the school recruited Wes and Caylie Dicken from Indiana specifically to teach in Oklahoma. To watch the video, click here. UNSTOPPABLE YOU: Former teacher Craig Conrad was fed up with seeing his students self-destruct. He now devotes his life to saving others. To see the video, click here. The Oklahoma State Department of Education has opened the door for teachers to take advantage of more openly licensed education materials for their classrooms. Oklahoma is now a #GoOpen state, meaning it is working with innovators from education technology companies, districts and nonprofit organizations that have committed to create new tools and provide professional learning opportunities to the 14 #GoOpen member states. Openly licensed resources are great for schools because they can be updated regularly and reduce overhead for districts, freeing up funds that can directly benefit students. After the launch of the #GoOpen initiative, states will be able to help local districts transition to the new model. Broken Arrow is the first Oklahoma district to pledge to #GoOpen; others are expected to follow. For more details on #GoOpen commitments made by states, school districts, and technology companies, click here or email Kurt Bernhardt at the OSDE to find out how to get involved. 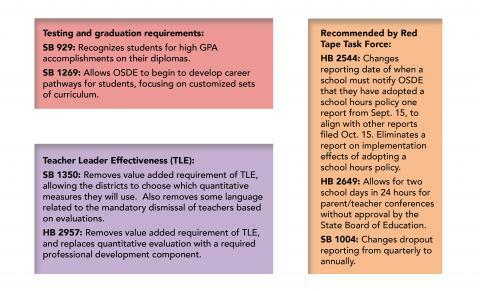 Below are some of the bills being considered in the state Legislature that would impact education. To look up any bill using the Legislature online search function, click here. If you would like to voice your opinion on a bill, contact to your legislators. To find your legislators’ contact information, click here.